The good news is Steam-A-Way can make short work of this task, using only earth-safe products that won’t harm your family, your pets, or this world we share. Steam-A-Way skillfully accomplishes the proper cleaning of ceramic tile. Heating purified water to over 230 degrees, we then inject an oxygenated form of hydrogen peroxide under 800+ lbs of pressure utilizing very specific tools and attachments. The cleaning results speak for themselves. Whether your tile is in your kitchen, bathroom, or some other area of your home, those stubborn stains, embedded bacteria, and germs don’t stand a chance. Your tile and grout will look very much as it did the day it was installed. At Steam-A-Way we are dedicated to helping you keep your home healthy, clean, and always looking its best. The solution to difficult ceramic tile and grout cleaning is just a phone call away. General cleaners not specifically formulated for natural stone or tile are never recommended. These can breakdown the sealer, thereby removing its protective properties and making the stone and tile grout susceptible to stains. Worse yet, many cleaning products, including those that contain lemon, vinegar, bleach or ammonia can etch away the polish, discolor the surface, or even scratch your stone. Many cleaners have what is called a chelating agent in them. This agent breaks down and dissolves minerals in hard water. Since all stone is made up of minerals, these types of cleaners will dissolve and cause streaks over prolonged use. Steam-A-Way offers the complete line of StoneTech Professional™ Products. Ceramic tile and grout is man-made clay fired material. Glazed ceramic tile does not normally require any protective treatment. It is the glaze itself that gives the tile its excellent protection and resistance to the absorption of dirt. Many of the new ceramic tiles in today's market are manufactured to look like real stone. 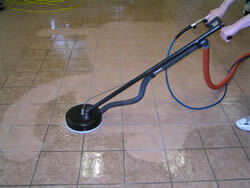 Steam-A-Way offers tile and grout cleaning and sealing. For best results, have your ceramic tile and grout sealed and use a neutral stone cleaner such as StoneTech Professional™ Stone and Tile Cleaner available through Steam-A-Way. Quarry tiles are an unglazed ceramic material. They are particularly well suited for exterior paving due to their low absorption and resistance to freezing. This type of floor is one of the most durable on the market today. Steam-A-Way offers cleaning or stripping along with sealing or a wax finish. For best results, have your quarry tile & pavers brick sealed and use a neutral stone cleaner like StoneTech Professional™ Stone and Tile Cleaner available through Steam-A-Way. Terracotta tile or Saltillo tile is one of the oldest ceramic materials made by man. This type of tile is created by mixing clay and water, leaving it to dry naturally and then baking it in a kiln. Saltillo tile has particular characteristics that demand special treatment. Steam-A-Way offers cleaning and sealing for this type of floor. For best results, have your terracotta tile or saltillo sealed and use a neutral stone cleaner such as StoneTech Professional™ Stone and Tile Cleaner available through Steam-A-Way.